This morning, as I was preparing for meditation, I saw this quote: “You receive what you have the courage to ask for”…how profound is that? Are you asking for less, are you asking with limitations? Are you asking with the energy of YES, I DESERVE MORE or I CANNOT ASK FOR TOO MUCH? 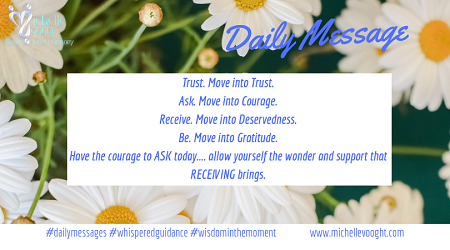 Have the courage to ask …. small, big, dreams, desires, needs…we receive in accordance with our asking. The energy with which you ask, is it filled with worthiness, deservedness, love, excitement, gratitude? Sometimes we ask with a compromising energy. We compromise when asking because deep down we feel we don’t deserve the FULL receiving, we feel guilty and therefore withhold on one level so as to receive on another level. You are fully deserving, you matter. Allow yourself to receive in ALL levels. Manifestation is simply asking for what you want, believing that you will receive this and then opening up your being to receive. Why does manifestation not work for me, you may ask? Reflect on your receiving energy at this time. Do you receive and give? Do you feel guilty when you receive? Asking for help and allowing others to give to us is the foundation of opening up to receiving. If you cannot receive on this level, how will you ask for that what you need? Manifestation works on vibration: if you subconsciously block out the willingness to receive or be supported, the energy of your manifestation will be blocked. Open your arms wide today, acknowledge to the Universe that you welcome help, that you are asking and that you are willing to receive. Notice all the ways in which you are already receiving. This could be in the form of time, opportunities, gifts, being taken out for a meal or even finding the perfect parking space. Start noticing the small things. Start asking for the smallest things and see how this expands into the manifestation of all your dreams and desires.